We had stayed the night at our friend's place so we could all drive from there to San Diego. It was a beautiful morning, and the weather looked awesome for the drive. We stopped at Laguna beach for breakfast at this little French cafe called 'Cest La Vie' which had an awesome view of the sea where we sat. We were off again! Our friend pulled down the top, and our hair started flying all over the place. I couldn't be gladder to have had chopped off the tresses before the trip. The Coronado bridge is the third deadliest suicide bridge in the US (the first being the Golden Gate bridge in San Francisco and the second being the Aurora Bridge in Seattle). Signs with suicide hotline numbers have been placed on the bridge for potential jumpers. We headed towards Point Loma, a peninsula that separates San Diego Bay from the Pacific Ocean. It's original name was 'La Punta de la Loma de San Diego' ('Hill Point of San Diego') but it was later anglicised to Point Loma. At the Southern tip of Point Loma is the Cabrillo National Monument. 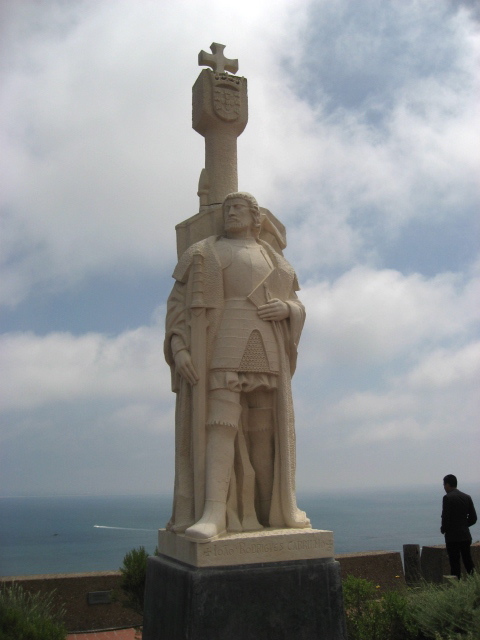 The monument commemorates the landing of Portugese navigator Juan Rodríguez Cabrillo at San Diego Bay in 1542. This was considered the first landing by a European in present-day California. Next up was SeaWorld. I read that the San Diego one in 1964 was the first ever SeaWorld park. Now it had been absolutely ages since I had last gone to an adventure park, so I was quite excited. We kicked off with 'Shipwreck rapids', a water ride. In retrospect, starting off with that was probably not a great idea. Signs all over said, "You WILL get wet, possibly soaked." but we didn't pay much heed. 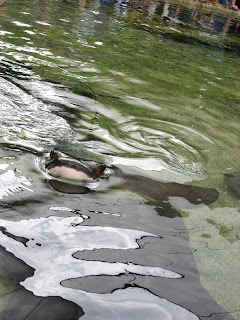 After all, how wet can you get sitting inside a rubber tyre that's travelling through a stream. The answer, as we were soon to find out: VERY. The so called 'rubber tyre' bounced and jumped in every direction, and the very uneven stream would often drive a large gush of water towards us. Add to that, we went right under a waterfall. Then there were overhead sprinklers and automated water pistols to target whatever dry region is accidentally left on your body. Both of us were wearing jeans, which of course, got soaked and we spent the rest of the day at SeaWorld walking around on very very cold legs. The Shamu show was absolutely fantastic. I had never seen a killer whale (also known as an orca) except on television, so I was gushing like a child at the sheer size of those things. Shamu does a mid-air flip. Check out the relative man-whale size! I was also wondering why they called it the Shamu show, when they did not specifically introduce any particular one of the whales as Shamu. So I read up later and found out that Shamu is just a stage name for these shows, after the original Shamu (the star of the show in the 60s and 70s) died in 1971. It was also interesting to know that the names "Shamu", "Namu" and "Ramu" were trademarked by SeaWorld and given to different killer whales at different times when performing in Shamu shows. Okay I forgot what the name of this weird-looking fish is. Flatfish? You could buy food for the sea lions and feed them yourself. Penguin zone. The one on the left looks headless, doesn't it?? After wrapping up SeaWorld, we drove around the city a bit. I'm always amazed at trams and the fact that they are still around! Dinner was at the historical neighbourhood of the Gaslamp Quarter. The name "Gaslamp Quarter" is a reference to the gas lamps that were common in San Diego in the late 19th and early 20th centuries. We ate at this little Mexican place called Rockin' Baja at the corner of one of the streets. At first glance, Viv read it as Rockin' Raja and was wondering whether we were going for Indian food (I had told him I wanted to OD on Mexican food on this trip till I was thoroughly sick of it). Dinner was great, and so was the martini I had ordered -- the Mexitini. We ended the day by going to another beach, La Jolla Cove, but did not last long as it was getting very very chilly. Parting shot of the day. I was keen to get a picture of any road sign with the word 'camino' in it (remember DDLJ where SRK yelled out 'Al camino, al kutton!'?). Sorry but I find the word hilarious. Check out the sign above. I can totally imagine Dharam Paaji grinding his teeth and saying "Camiiiiino Capistraaaaano!" we want text also! what's this photos only!!! I’m in SD right now and seriously, this town is sick!! If you’re interested, you can check out the website www.sandiego-studenthousing.com. I found it on the Internet and seriously, it’s really worth a peek !